Editor’s Note: Heading into the Sept. 8 Williams Grove Half-Mile, the 16th race of AFT’s 18-race 2018 season, a few things were clear. We knew that Jared Mees, last year’s AFT Twins presented by Vance & Hines champion, had already sewn up the 2018 title with his runner-up finish at the Springfield Mile II – a race won in dramatic, last-lap fashion by teammate Bryan Smith. We also knew AFT Singles points leader Dan Bromley could sew up that title by simply finishing ahead of second-in-points Ryan Wells. As it happened, brothers Briar and Bronson Bauman went one-two at Williams Grove, topping third-place Mees in a thrilling AFT Twins Main Event. Bromley rode to a conservative seventh-place finish (though just 5 seconds back of winner Tanner Dean after 15 hard laps) but easily bested Wells, who struggled to finish fifteenth. The title was Bromley’s first-ever. Williams Grove 2018 produced exciting racing despite the gloomy weather, which spit rain all day and threatened a deluge but which held off just long enough to allow AFT’s shortened schedule to play out. A lot happened on Saturday in central Pennsylvania, and to bring some of the behind-the-scenes action to fans – along with Scott Hunter’s phenomenal photography – we’re introducing this National Notes section. We’ll continue doing this for the rest of 2018 and into the 2019 season, which promises loads of surprises, so stay tuned. Enjoy. Lead Image (above): To his fellow competitors at Williams Grove, Briar Bauman was a blur … fast, consistent and in control throughout. 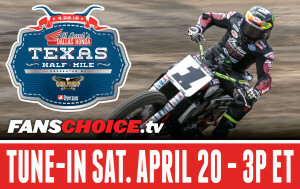 Launchpad: It’s a massive understatement to say that good starts are key in AFT competition – and flat track racing generally. Briar Bauman (14) proved the point nicely at Williams Grove with a great launch and holeshot from the inside despite red flags during the Main that leveled playing field with multiple restarts. Still, BB ran fast all race long and snagged his first win of the season. “It’s how you want it to happen,” he said later. Smith and Co: One of the so-called ‘PA Posse’ is Cameron Smith (right), who hails from Coatesville, PA, just west of Philadelphia – and not that far from Mechanicsburg. 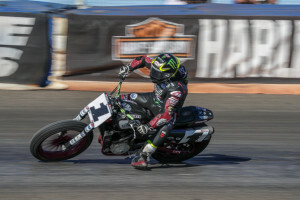 Pennsylvania riders such as Smith, the Texters, Dan Bromley, Jared Mees and Brandon Robinson heard some of the loudest cheers on Saturday afternoon and evening. That’s designer and fellow Smith team member Dave Evans with Cameron. Mile-Master Woes: Bryan Smith lost a clutch four laps into his Semi, which left him out in the cold and rain for the Williams Grove Main. Still, the Swartz Creek, Michigan rider and Mile-mastering 2016 Grand National Champion wasn’t sour. “I’m not in the championship hunt and not worried about points,” the Springfield Mile II winner said. “But I am about winning races, and I’m definitely looking forward to these next two Miles.” It’s going to be a lot of fun to watch. When it rains... : Mother Nature wasn’t playing all that nicely last weekend, but she relented just enough mid-day and into the evening to allow AFT to get a shortened program in before the rains came. That was the good news. The bad news is that teams had very little time to adjust for a changing racetrack. As always, that’s racing. 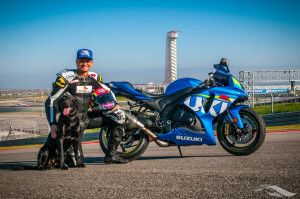 CTex: Cory Texter is no stranger to AFT Twins competition, having climbed the podium more than once in his Twins career. 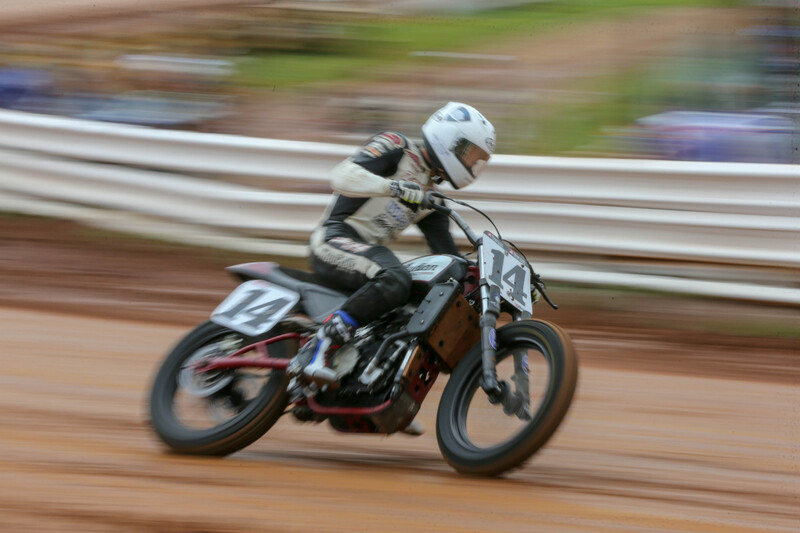 "A few days before Williams Grove,” said Texter, who’s been running in the AFT Singles division this year, “I got the opportunity to ride an Indian FTR750 for the rest of the season. I made the move immediately but it presented challenges, especially with a rain-shortened program. The bike was bone stock, we had a hard time getting the suspension dialed, and after the race I found I was several teeth off on gearing. Not ideal. But I’ll keep working hard to get some momentum going because I know I can still run up front. We’ve found a lot of things we can do to make the bike better and I need to improve as a rider, so I’ll keep working and see what we can do in Minnesota." Fan Appreciation: Hats off to the Williams Grove fans, who not only braved rain and schedule hitches during the afternoon but who also ignored the weather reports and naysayers during Friday and on Saturday morning and actually showed up at the Speedway – many to watch local PA heroes compete. Williams Grove Speedway has been in existence since 1939, and with fans like these it’ll likely be going for decades. 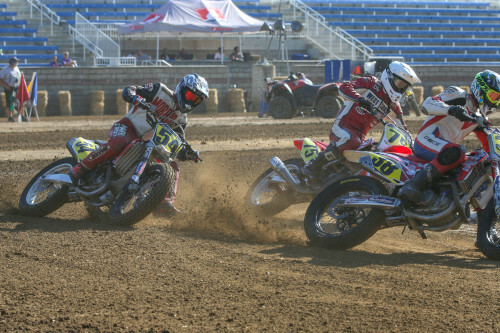 Mutual Respect: The on-track battles and natural competition between the two companies is to be expected, but the Harley-Davidson and Indian Motorcycle factory guys still find time to chat, as a lot of these crew members are longtime friends and members of the flat track community. Indian’s Ron Glidden and V&H/Harley-Davidson’s Rich Hankins demonstrate. The Champ Speaks: Here’s the 2018 AFT Singles champ’s take on the historic day: “The track was definitely tricky, and tacky. I wore a knee brace so I wouldn’t catch my foot in a rut or hole. The track got better throughout the day and a defined line was forming entering the turns, but from the middle to exit it was fair game everywhere. In the Semi I found a good line coming off the bottom and was following Wells for most of the race. I knew I could pass him but I didn’t want to show him I could in case I needed it in the Main. I got a terrible start in the Main but was able to salvage it a little coming out of two and was in fifth place. I ran there for most of the race and the line I had in the Semi wasn’t there. I spent most of the second half of the race checking the Jumbotron to see where Wells was but couldn’t quite tell, so I kept my line and counted down the laps. With two laps left I peeked over and saw Jesse and Oliver and knew I could trust them on the final laps. When I got the checkered flag I was overwhelmed knowing I’d just won my first professional championship!” Nicely done, Brom. A Bromley Family Affair: The Bromley family was understandably overjoyed with Dan’s AFT Singles championship, and there was relief, too. “We were plenty relieved,” said Dan’s father Joe. “I bought 25 tickets and we had all sorts of family and friends in attendance. We knew we might have wait until Minneapolis or even New Jersey for Dan to possibly clinch, but with everyone there it was really nice he was able to do it locally at Williams Grove. It was a little ugly, but he did what he needed to do, and we’re all very happy with the outcome.” Left to right: Joe’s mother Jean, Nick Henderson, Dan Bromley, Dan’s girlfriend Connor, Joe’s brother Steve, Joe Bromley and wife Bernadette.